The enjoyment of tea encourages us to engage all of our senses. Look at the shape and colour of the dry leaves, watch them unfurl and swirl in the hot water. Feel the cool smoothness of gyokuro leaves or the nubbly texture of a Buddha’s hand oolong leaf. Listen to the water boiling in the kettle, then as it’s poured from kettle to teapot to cup. Savour each sip, perceiving the range of tastes playing across your palate. Our sense of smell may be the most important, and most varied, aspect of enjoying tea. Sniff the dry leaf in the sack or tin immediately after opening it to draw in the scent; again when you first pour hot water onto the leaves; and once more when bringing cup to lips. After the teapot is empty, lift the cover and take in the lingering bouquet graciously left by the tea on the interior of the pot. To further enhance the olfactory appreciation of tea, in the mid-1900s the aroma cup was created in Taiwan. Also called a fragrance or smelling cup, this is a small cylindrical cup (wen xiang bei) paired with a small drinking cup (cha bei). Altho’ these were specifically designed to amplify the aromas of fragrant Taiwan oolongs, you can of course try it with other types of teas. Three aroma cup sets from my own collection: Decorative china with flange, celadon porcelain in a bulb shape, and a traditional partially glazed red clay. Fresh-made tea is first poured into the tall cup and allowed to rest for a few moments, then emptied into the drinking cup. If you’re nimble, you can add some drama to this procedure by inverting the drinking cup over the aroma cup that has been filled with tea, lift the cups together with thumb and middle finger of one hand, and quickly flip them over to transfer the tea into the drinking cup. Otherwise, simply pour the tea from the aroma cup into the drinking cup. The aroma cup is then raised toward the nose to smell the lingering tea fragrance, which is intensified by the cylindrical shape. Sniff … and ahhhh! Aromas last for about a minute, during which time they subtly change as the cup cools, offering multiple nuances of scent. Alternate smelling and drinking the tea from the two cups to fully enjoy this ritual. It’s been said that smell is the most evocative of all the senses, that a mere hint of a familiar scent can draw us immediately to another time and place. Certainly this is true of the fragrances of tea. If you don’t already use an aroma cup to enhance your tea enjoyment, I highly recommend that you give it a try. I don’t drink coffee. While I absolutely adore the aroma, it seems to me that the aroma promises more than the taste delivers. Far more. In fact, I really don’t like drinking coffee at all. And I don’t like drinking tea out of the clunky mugs or heavy cups designed for coffee. No, I much prefer delicate teacups — with handles, without handles, and preferably made of glass. Because a large part of the enjoyment of tea is the visuals — the unfurling of the leaves, the play of light on tea liquor, and the multitude of colours that made tea encompasses. 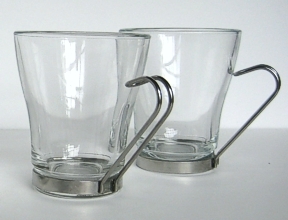 Whenever I go into a tea shop, an antiques shop, a tableware shop, or any shop that has cups on offer, I’m immediately drawn to the one/s made of glass. Which is how, a good fifteen or so years ago, I came upon my first teacup that was really a coffee cup. I’ve since learned that its proper designation is cappuccino cup, with cappuccino being some sort of coffee affair topped with whipped cream. Inasmuch as I wouldn’t know a cappuccino from a concertino, I bought the tea cup and added it to my collection. 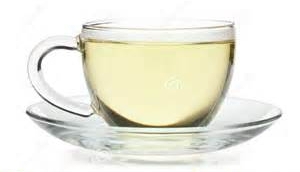 Perhaps you’ve noticed that teacups are generally tapered, with a smaller bottom opening to a wider rim. This is true of both Asian and Western style teacups. Unlike coffee cups, which normally have straight sides so the bottom of the cup is about the same as the top. I’ve been told that teacups have wider tops so the tea cools more quickly at the top; I’ve also been told that it’s so you can enjoy the aroma while you’re sipping. The cappuccino teacup is similarly small at the bottom and wider at the top, which is pretty much why I presumed it was a teacup. It was immediately put into service to showcase the many shades of black teas, from ebony to chestnut to auburn to burnt sienna to topaz to gold. While I could have used it for any kind of tea, I tend to drink my black teas from a larger cup than other types of teas — greens, oolongs, white teas. A few years ago I was shopping at a beautiful homewares shop in Bucuresti, Romania that specialized in Spanish and Italian imports. And there was a cup of the same funnel-like shape as my cappuccino teacup but about one-fourth the size. Yes! Now I had the perfect cup for my green, oolong, and white teas. Even if I have since learned that its proper designation is espresso cup — espresso, again, being some sort of coffee preparation. The two cups are now amongst the most often used of my good-sized collection of glass teacups. 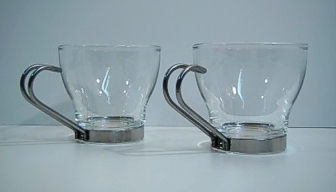 I like everything about them: the size(s), the shape, the handle that lets me hold it when a glass handle, or a handle-less cup, would be too hot. In my not-so-humble opinion, these cups were mis-named to start with, and I have in fact elevated their status by using them for tea rather than for coffee!